Caleb was cursed to Raven form five thousand years ago. In order to free himself, he must watch over Keeleigh. With her pointed ears and magickal gifts, she has always felt like an outsider. Keeleigh craves to learn more about her Elvin heritage. Caleb must face the Shadows to protect his charge. He asks for the help of his fellow Ravens. Jet must keep an eye on Paget. He must find the Shadows who are out to kill her. Paget's icy suitor, Malik, wants her all to himself. Before he can claim her, the Shadows attack. Jet will do anything to save her and asks the other Ravens to help him so he won't lose the one he loves. Publisher's Note: Raven's Saga 2 Duet contains the previously published novels An Eternity of Shadows and Frost Fever. Look for A Conspiracy of Ravens, Fur & Feathers, Whispers in the Dark, in Raven's Saga 1 Box Set. 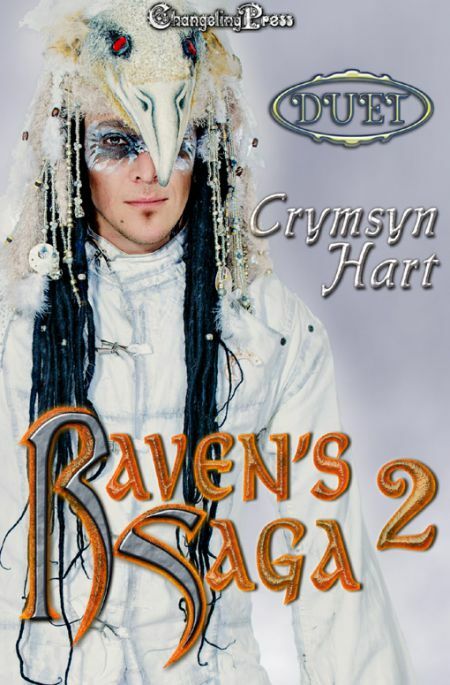 "Raven's Saga 2 (Duet)" is also available through Amazon, Barnes & Noble, Kobo, and iTunes! The earth rumbled and shook beneath Caleb's feet. The omens had been indicating devastation for months. No one had believed them until the first earthquake claimed the northern section of the island. Thankfully, it wasn't inhabited, having been abandoned a century ago when the land suddenly went sour and could no longer be farmed. Some inhabitants of the island had fled then, looking for shelter across the ocean. After the earth had been swallowed up by the frothing water, panic ensued around the isle. Their tightly knit government came apart at the seams. No one wanted to believe their home, their sanctuary, was coming to an end. And through all of it, his father had stayed the course and tried to rule the best he could. Atlantis held a technologically advanced society. They had been granted years of prosperity, good health, wealth, and magick. Caleb had studied the sciences, the stars, and even the darker magicks, with all the soothsayers and priestesses he could find on the island. Their home had religious freedom and gateways to other realms, but he'd never crossed over into them. He had lived and loved, done what his father had bid him, but now with the destruction of his home imminent, he threw everything he knew aside. The latest quake had taken the life of the woman he loved. Now, Caleb stood staring down at her lifeless form. Everything about her still appeared perfect. She had died the night before while he had been helping his father try to control a panicking mob in the town square. When he learned of his beloved's death, his heart grew cold, and he swore he would do everything he could to right the wrong. Even if it meant going against the laws he'd been taught. A silver dagger hovered over his palm, a razor sharp edge ready to slice his flesh. Caleb knew he was breaking a most ancient taboo. He was calling on the goddess Morrigain, the Raven Mistress, who ruled the path of the dead. It was forbidden to breach the land of the dead and reunite souls with their bodies. The magick went wrong in most cases, creating horrible, twisted creatures. This was why the magick was banned centuries ago, but the knowledge was still available if one knew the correct people to ask. Caleb had learned the ritual from a priestess who time had forgotten. He gazed down at his beloved in her emerald dress. The garment she was going to be married in. It brought out the color of her dark chocolate hair. "I will bring you back to me. We were meant to be together. You are my heartmate, for now and always." He ran his free hand over her cheek one last time and then brought the dagger across his palm. Caleb gritted his teeth. He squeezed the blood from his hand onto his beloved's chest, over her heart, and drew a crude symbol of Morrigain, three ravens in a circle touching beak to tail. He then removed a small pouch from his waist and sprinkled a handful of fresh hemlock over the blood. The herb was poisonous to humans, but if used in a ritual like this, it could summon the dead back from the other realm. "Hear me, Dark Mistress, Ruler of the Dead. I ask you to bring the soul of Betha back to me from beyond the Gray." His beloved's eyes opened. They were not the sea-blue ones he knew. They were white. The corpse's mouth opened. "Who is it that invokes the Mistress of the Dead?" The voice coming from Betha's throat was not hers. Blue energy crackled around the corpse. "I, Caleb, son of Horat, have called upon you." "Caleb, what are you doing?" his father asked from behind him. At that moment, the lifeless body sat up and grabbed Caleb around the throat. Its dead eyes peered into his. This was not the woman he loved. He was speaking with the goddess herself. "A sacrifice is required in order to ferry the souls of the dead back to the living. Will you pay?" The soft hair of the woman he loved began to turn white. Her skin grew gray and flaked off until he could see bone underneath. Betha's teeth grew pointy. "Dark Mistress, Morrigain, please! He's my only son! You must not take him," his father pleaded. "Father, stay out of this!" Caleb wheezed. He had done everything he could so that his father wouldn't find out what he was doing because his father would condemn it. The corpse smiled and turned its attention to his father. "And what will you give me in return for this one's soul? Already his bargain has been struck, but I can amend his sentence." His father got to his knees and clasped his hands, prostrating himself before the goddess. "Anything, my soul, eternal servitude, what it is you wish, Great Mistress? He's my only son." The corpse now inhabited by Morrigain glanced between him and his father. A wicked smile spread on her thin lips. "I curse you, son of Horat. I curse you with immortality to be one of my Ravens. You will be at my beck and call watching over those you're charged with. You have paid your price in blood to have the one you love returned to you, but even then there's a hefty fine to pay. She will live, but not the way you think. You will see her. You will know her to be your Queen, to do her bidding for she will rule you. Three days and nights of the full moon, along with the Eight Sacred Holidays, I grant you to be a man. Never will you be able to know the touch of a woman unless it is your heartmate. If you defy me in this, then you will turn into a raven the minute you wish to take her. To be a man again, your heartmate must accept you for everything that you are. Will you live by this curse so that you'll see your beloved and save your own soul?" Caleb shut his eyes and tried to breathe. Her grip was killing him. He had no choice but to accept or he'd die. This way he could see Betha again and watch over her for all time. He would do anything to have that. He would do anything to bring her back. It was all he wanted. "Yes." Morrigain didn't hesitate. She ripped his shirt with her sharp nails and placed her hand on his left shoulder. Something seared his flesh. "Bear my mark so those who see you will know for all time you are my Raven Warrior." Pain filled his senses. His flesh melted and bubbled. Morrigain's mark was branded into his soul. He felt it all the way down to the core of his being. The goddess released her strangling grip, dropping him to the floor. When the agony of her power finally left him, he immediately felt himself twisting and shrinking. Caleb tried to cry out, but all that left his mouth was a raven's scream.